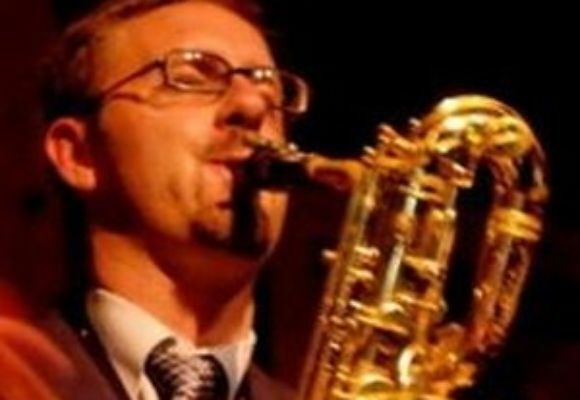 Los Angeles based Baritone Saxophonist Adam Schroeder is rapidly becoming a major force throughout the global jazz scene. Schroeder is known equally for his studious leadership as well as his musicality in Anthony Wilson's Nonet (Los Angeles), Bennie Wallace's Nonet (New York), the Clark Terry Big Band (New York), & the Adam Schroeder Quartet/Quintet. Born and raised in Sioux City, Iowa in 1978, Adam began his musical studies on alto saxophone while in grade school. After Mr. Schroeder's introduction to Charlie Parker in 1992, his musical interest became fixed solely within the Jazz Idiom. Between his junior and senior year is when Mr. Schroeder finally discovered his saxophonistic voice, switching from the Alto over to the Baritone Saxophone. Later that same year, Adam was asked to fill the baritone sax role in the student big band at Clark Terry's International Institute of Jazz Studies. (Westmar University in LeMars, IA) This decision sparked a relationship with the famed Clark Terry, thus leading to a multitude of musical opportunities for the two players. Clark asked Adam if he would consider his jazz institute as a place of residency during his college years, which Adam accepted with great honor. Unfortunately during Adam's freshman year at the CTI, Westmar University cut the Jazz Institute's funding. Upon Clark's recommendation, Adam, along with most of the students, transfered to Southwest Texas State University (now Texas State University) where he would graduate in 2000 with a BM in Jazz Studies. Mr. Schroeder regularly performed in Austin, San Antonio, Dallas, & Houston. In 1998, at the Corpus Christi Jazz Festival, he was featured with the late Nick Brignola during the Festival's "Saturday Night Sax."